Hey all! After a 4 month bending and soldering adventure I'm pretty much ready to get back to some good old fashioned glue and plastic model building. This little fellow caught my eye when it was released...so without too much thought I decided to give it a go. Though tempted, I've resisted purchasing any aftermarket items (so far) and intend to do this build OOTB - with any detailing coming from the spares box or scratchwork - just a clean, quick build. 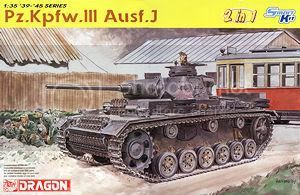 As the box was arriving in the mail, our weather here in Oregon turned decidely fall, with early rain and cool temperatures in town and snow advisories in the nearby Cascade Mtns.....of couse I'd have to build a winter panzer. I decided to that Kharkov would be the perfect "winter paradise" for my panzer to play...so after a little research I found some information from Das Reich's involvement in the battle. On February 1st 1943 the divisioin had 66 Pz III's, on March 4th that number was reduced to 11. In May 1943, the surviving Pz lll's were retired in preperation for re-equipment for Operatioin Citidel. 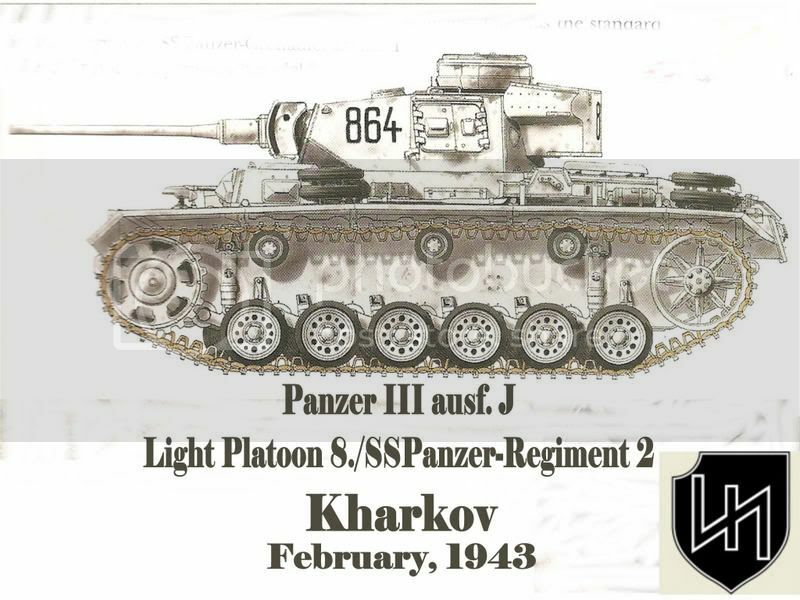 One of the surviving Pz III's from the Kharkov battles was # 864. I found this color plate of 864 in Tigers in Combat II, pg. 335., by Wolfgang Schneider, Stackpole Books. And so with the introduction out of the way, let's build! Cool Rick. I hope to get mine next week. Good luck on the winter scheme as they can be tricky. Rick I have one of these moving up the "next in line" list, and will watch this build with interest. Do you know if the tank in the photo you posted has smoke grenade launchers on the turret? It's hard to tell, but something is in that general area. It also looks like from the photo that the area covered in whitewash was significantly less than in the color plate you posted. After watching your wizardry on the M2 Half track I can't wait to see this one! cant wait to see the first photos! This should be good...I've got one on the shelf and the detail is superb. Wont be quite the same watching your build and seeing plastic!!!! I like the Volstad boxart, so perhaps copy the fence, with soldiers trying to peek through holes and cracks of the wood?!? is this vehicle really Ausf. J ? 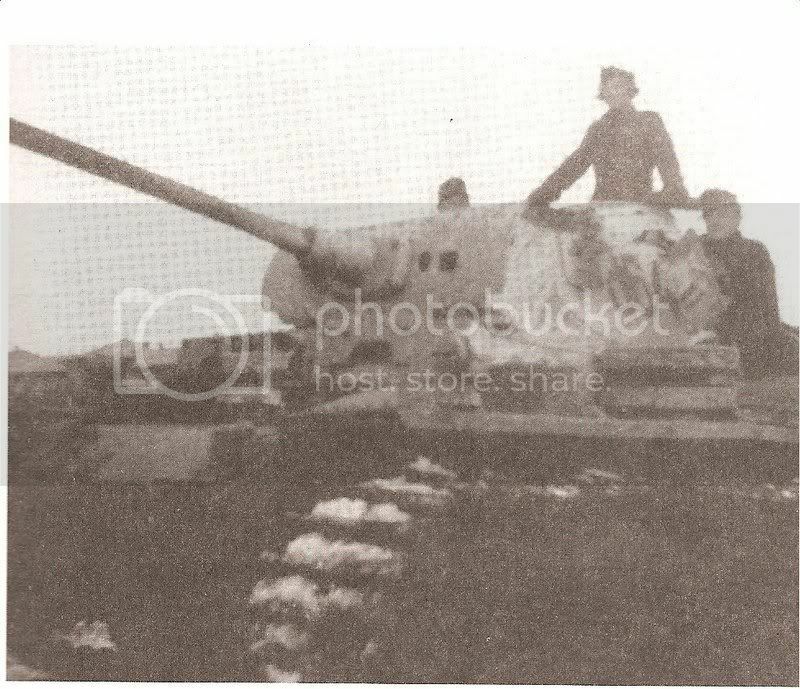 I think , this is PzKpfw III Ausf. M !!! PS - sorry, I can´t upload the photo - Don´t know why ? Last edited by Arhad; 10-05-2007 at 04:06 AM. Looking forward to this one Rick. This one was (is) on my wish list, and I would start building it, if only I had the time. This will give you an oppertunity to try out the Life color paints as well.